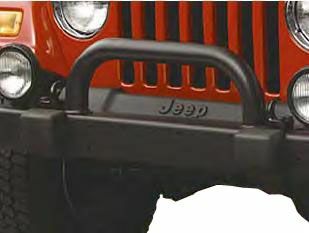 Tubular Grille Guards for the Jeep Wrangler are designed specifically to match the contours of the front grille and bumper. This rugged guard helps protect grille from off-road damage. Cool add on, and proportionately correct. Nice mod to stock jeep that will unfortunately see little off roading yet needed a little cool factor boost. Easy to install and looks like it came with my 2004 TJ. Great Guard, Light Weight but Solid. I bought this guard by cause I just wanted a little extra protection against idiots on the road pulling out in from of me. The guard is light, which is good because my Jeep has the 2.5. Made by Mopar in Canada. Bolts on perfect and I get tons of compliments on it. ProsLight, Sturdy, easy installation, works with tow hooks.